Our lives are filled with bits and pieces. Photos, clippings, postcards, holiday and birthday cards. They help us celebrate the events -- big and small -- in our lives. They also reflect our interests: collections of things that fascinate, touch or amuse us. They sit in boxes, in albums, occasionally on noticeboards or attached to the refrigerator by magnets. If they are digital photographs, they lurk on computers, infrequently seen. We also spend increasing amounts of time in front of computer monitors -- so why not merge the two? I have used a selection of inexpensive or free software packages to turn my monitors into a virtual noticeboard, a virtual refrigerator, a virtual photo album and more. After creating collages of my favourite pictures and clippings with Corel PaintShop, I used Bionix Wallpaper Changer to change the wallpaper on my computer desktop at regular intervals, and Anyimage Screensaver to flip through images when my computer is not in use. In this article, I will go through the steps I took to achieve these. There are two sets of files to download if you want to try this for yourself, and links to the software that I used. There are free or trial versions of the programs for you to experiment with. If creating these virtual albums seems like too much effort and you just want to swap your digital photographs, you can install Bionix Wallpaper Changer and/or AnyImage Screen Saver and use them to swap your wallpapers and screen saver images regularly. Creating these virtual albums (and noticeboard etc) is a good way to try out different functions in PaintShop. I confess to liking pretty pictures of houses, especially libraries. I collect cat cards, and photos of my cats and friends, and jokes and cartoons. That's a lot of bits of paper and card. See the situation? Can you relate to this collection of collections? The first step I took was to scan all these bits and pieces into the computer. With so many people having digital cameras, the scanner is becoming less popular. Scanners are not expensive and can be purchased as part of a multi-function device (printer/scanner) or as a single unit. If you have a lot of material to scan I recommend that you set the PC/notebook/Mac up in front of the TV or you can watch DVDs in a window using VideoLan or Windows Media Player or something similar as this is a repetitive task. Note: If your family archives include a lot of slide photos or print negatives, consider a scanner that can scan these, or you can go to a company that will can material for you, for a price. These are available for Windows PCs. Check the relevant sites to ensure that they will run on your PC. Corel PaintShop X6 has a 30 day fully functioning free trial version (click here) . If you like it, you can pay for a license online, enter the license number and continue using it after 30 days. PaintShop X6 sets up a 32-bit and a 64-bit version to enable users to keep older plug-ins. We used PaintShop for adjusting image size, colour, special effects, and making up the wallpapers and screen saver images. PaintShop also enabled us to create three-dimensional 'magnets' and 'photo corners'. If you are new to PaintShop, you may want to check out the video tutorials hosted on YouTube. Corel also has video tutorials on their site. 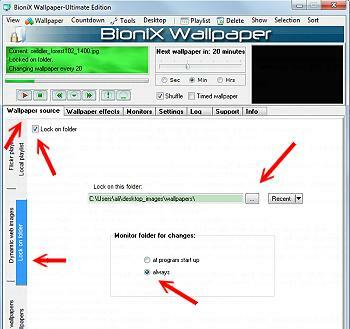 There are three versions of Bionix Wallpaper Changer: Lite (free), Extreme and Ultimate. The free version is limited to 500 different wallpapers, which can be in any folder on your PC. The Ultimate version enables you to have an unlimited number of wallpaper images. There is a comparison chart on the Bionix web site. Bionix Wallpaper Changer includes some very smart functionality to create the most attractive results regardless of the original size of the image. It supports dual monitors, even if they are of different sizes, you can spread an image across both monitors, have different images on each monitor or clone the images. With Wallpaper Changer you can have the wallpapers pn your desktop change automatically at specific times, at regular intervals (that you set), even have different wallpapers for day or evening. You can create playlists of images to be used as wallpapers or point the program at a specific folder and it will use everything in that folder (and sub-folders), even if you add more files. To download, or for more information about Bionix Wallpaper Changer click here. Yes, Windows includes a wallpaper changer, but it is limited to looking at one folder and doesn't have the image enhancement capabilities or other features. Bionix Wallpaper Changer is one of the free software products that we recommend on our free stuff page. For a screen saver we selected AnyImage Screen Saver which has been running on our machines for years. AnyImage will swap images at selected intervals with a wide range of transitions. It will use images from a folder and its sub-folders. Because people's familiarity with computer software varies, we are going to start with a summary of the procedures. For those who know PaintShop, or who have an alternative they can use, they can follow the steps without detailed instructions. After the summary we will have a link to go through the process of setting up Bionix Wallpaper Changer, AnyImage Screen Saver and working out what size to make your wallpaper and screen saver images for this project. Install Corel PaintShop X6 trial version using the defaults. Finally, we will have step-by-step detailed instructions for creating the wallpapers and screen saver images. Although Bionix Wallpaper Changer has playlists that can point to anywhere on the PC, for neatness sake we created a structure that enables the AnyImage Screen Saver to display wallpapers as well as screen saver images. In Bionix Wallpaper Changer, click on Wallpaper Source, Lock on Folder, and browse to the folder desktop_images\wallpapers. From the Windows Desktop, select Personalise, Screen saver, and select AnyImage. Choose your preferred time to wait before the screen saver starts. Click on Settings, Options and point to desktop_images and tick the "include sub-directories" box, then click Save. Install Corel PaintShop X6 or use your preferred image manipulation software. Click here to download the files as JPGs only, or click here to download the files as JPGs and Corel's multi-layer format. Save the files to wallpapers_source. You will see a corkboard background and an array of pushpins as individual layers. Resize the corkboard layer according to your monitors, remember Bionix Wallpaper Changer will adjust if you have dual monitors of different sizes. In Corel PaintShop X6, Image, Resize, and click on advanced settings to unlock the image ratio. For ease of handling select, Image, Canvas size, and change to your wallpaper size. Save this now. You can change the colours of the pushpins by selecting each one and selecting from the pull-down menus, Adjust, Hue and Saturation and playing with the Hue/Saturation settings. 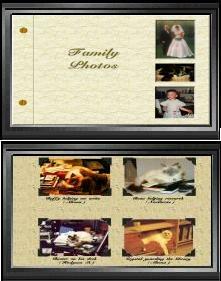 Open your own photos or other images and copy each one to the corkboard. Resize the photos, to your preference, rotate them if you like, and drop the pushpins in place. You can resize, copy and paste, rotate and change the color of the pushpins. Save this under a new name (even corkboard01, for example) as a pspimage to wallpapers_source, and the Save As a JPG so that you can use it as a wallpaper in desktop_image\wallpapers. Now is a good time to have a look at the settings, especially the frequency at which the wallpapers will change. You can set Bionix Wallpaper Changer up so it changes the wallpaper on startup and then shuts down, for example. You may want to refine the image, moving layers out of the way of icons, for example. It's a good idea, especially early on, to keep the pspimage format files so that you can tweak the wallpapers. You will see a refrigerator door background and an array of magnets as individual layers. Resize the refrigerator door (background) layer according to your monitors. In Corel PaintShop X6, Image, Resize, and click on advanced settings to unlock the image ratio. For ease of handling select, Image, Canvas size, and change to your wallpaper size. Save this now. You can create magnets of your own using Corel's 3D effects. Open the image file, select the object (use selection tools if needed), then Effects, 3D, Inner Bevel or Outer Bevel, experiment to see the effect. Open your own photos or other images and copy each one to the corkboard. Resize the photos, to your preference, rotate them if you like, and drop the magnets in place. You can resize, copy and paste, rotate and change the color of the magnets. Save this under a new name (even refrigerator01, for example) as a pspimage to wallpapers_source, and the Save As a JPG so that you can use it as a wallpaper in desktop_image\wallpapers. The virtual photo album pages are created the same way as the noticeboard, except that photo corners are used to 'hold' the photos in place. Use the Text tool (T on the left hand side of the screen) to create captions. The photo album cover has three windows with layers that can be 'filled' with photos.